It was appropriate to watch the sunset from my window seat as I flew out of Japan. Two months in Okinawa feels like two days. Until now, my shortest stay on the beautiful island had been just over a year. To have such a short time to enjoy its bounty felt a little stifling, but I am thankful for every minute I was given! Restrictions placed on marines by their command caused attendance dwindled during the summer. Because of this, their project fell behind and its completion looked bleak. Over the last two weeks, however, a couple of the marines and an airman were able to spend extra time catching up and completing the board. Both classes worked hard to finish their projects, and they look fantastic! It was a joy to work with each group, even amidst the frustration of red tape and language barriers. A valuable lesson to learn, however, is that every design solution must overcome its own set of unknown problems. And, what often seems like the death of an idea, is the birth of a better one. Post-production party! My co-worker, Kenji, and I are flanked by marines and airmen. The graphic design for this board is based on the Okinawa flag. The kanji, “Taco Casa,” is our faux design company name. In Japanese, it translates as “octopus umbrella.” The multi-language pun was born out of discussions about empathy in the high school class. The board design features a silhouette of Okinawa and represents the fusion of local and foreign island culture. Okinawans often identify with Hawaiian and Jamaican culture. At any given festival, you might take in traditional Okinawan dancers, a hula performance, and a reggae band. Now that my portion of the fellowship is over, the program is in the hands of my supervisor and of the chaplain who participated in the adult class. The chaplain is planning to start a surfboard design program on the base where he works, as a way to mentor more young marines. My supervisor is looking at future design projects with high school students. He is also training his staff in Design Thinking for creative leadership. I am now back in the country scouring job boards for gainful employment (I’m open to suggestions). Meanwhile, I will continue developing the creative leadership curriculum for community development organizations and philanthropic companies. Design Thinking and creative leadership can be valuable tools to enable communities to design sustainable, indigenous solutions toward a better life. I am ever grateful to Maharam and RISD for such a rich opportunity to explore an idea and empower others to create! Miyagi-San invited me back to the studio for a private master class. I threw 3 somewhat round vessels. Once they had dried, Aki, his studio assistant shaped them into beautiful bowls. It’s incredible what the master can do with such poor material! One of the goals driving my work forward this summer was forming a dialogue between my own practice and the robotics lab. Doing this in an authentic way is no easy task given the esoteric nature of my artistic practice: the core problem I’m addressing is memorization, specifically concerning the infinite, non-repeating number π. In conversations with my cooperating supervisor at the lab, Dr. Bill Smart, we touched on the idea that memorizing π is a means of trying to be more like a machine. There are significant tensions suggested by this idea. Am I making myself more machine-like, or creating a humanized version of π? Am I imitating the precision of a digital system, or is the process somehow machine-like? These questions might be posed as a kind of more literal and modest version of Warhol’s “I want to be a machine.” Bill and I spoke about means by which this might be represented through robotic movement and the idea that something is being conserved. This led to a work called Entropy Conservation. In Entropy Conservation the randomness I generate by typing π is offset by the movements of a robot. I type π from memory into a laptop, which evaluates my progress and controls a PR2 robot to move with varying degrees of randomness. The more efficiently I recall π the simpler the movement of the arms, while slowness and inaccuracies lead to complexity. If the digits of π are considered random then, in a sense, entropy is conserved. The PR2’s arms have 7 joints each, allowing for a a great deal of freedom when designing movement. It was important to me that the robot was more than a means to an end, but an actor in the work roughly equal to me in presence. That presence creates space for questioning the process through which this “conservation” is accomplished. π and the robot are communicating through numerical representation (according to theorist Lev Manovitch this is a unifying “principle of new media”). The robot’s movements, while dependent on the digits, are being controlled by the human data I’m generating by recalling π from memory, and which it then interprets. But that data is limited. Within the narrative of the work itself this implies a certain agency inherent in the robot. Societally the implications of this might be significant. For example, recent research by BF Malle suggests that people are more comfortable (in some contexts) seeing robots act in a utilitarian manner, which to my mind implies uncertainty about robot agency. With this in mind, the nature of the exchange of data between humans and robots deserves serious attention within the field of human-robot interaction. To assist with Constant Entropy I developed πGame, a simple, modular command line tool for recording information and displaying feedback when someone is recalling π from memory. Since ROS uses independent Nodes, this can be used within different ROS projects to evaluate someone’s performance when recalling π and extracting data. In keeping with my surroundings over the summer, I dedicated significant time to artistic research via experiments and short trials. Many of these involved simulation tools within ROS. At least one involved a somewhat novel control system: a Dance Dance Revolution pad. I created a simple program (that can be used with ROS to control robots) that allows a user to recalls the digits of π through dance. In its first iteration, though, the controller proved too unreliable to document. In addition to this I continued strands of my own practice that had less to do with robotics. This included some painting as well as a series of drawings in which I “compiled” code by drawing it from memory. To keep up with my other work please feel free to visit my site. It’s hard to overstate the importance of programs like the Maharam Fellowship for broadening the scope of an artist’s understanding and practice in one short summer. Concurrently, robotics labs (like this one) that value conceptual variety and input from traditionally separate fields are providing students with truly meaningful experiences. For me, this was an experience at once new to my practice and perfectly willing to be in dialogue with it. As such I can tell it will have a voice within my work for a long time to come. My experience at the lab has come to a close. This post will provide a look back at the experience and the next will look at some documentation of my work from this summer. Going right back to the premise of my experience, I’ve encountered several people (in the lab and outside of it) who seem unsure of why an artist would be interested in robotics. While digital media artists often work with robotic systems, this question is significant. The back and forth of digital/physical information is at its core a profound problem. Interacting with the physical world using digital media makes both sides richer. Digital systems become more complex (there are more sources of data), while robotics allows us to do things that we typically wouldn’t in the physical world, or it allows us to do them in new ways. I found that an important component of understanding the lab was creating space for discourse between my own practice and the lab itself. This isn’t something that happened overnight. I naturally continued my artistic practice throughout my entire time there, but finding that link connecting the conceptual space of the lab and my work was significantly more involved. In part the work was comprised of teaching myself new languages (most notably, ROS and Python). But on another level it was a matter of observing and learning from the lab and the roboticists working there. This gradual process is precisely the reason that the Maharam fellowship is so invaluable. A shorter or less rigorous experience wouldn’t have been able to provide me with the insight that this experience did. But, likewise, taking the approach of formal education wouldn’t have allowed me to freedom to connect the experience so naturally to my own practice. I often thought of this experience as a three-part inquiry: I sought to better understand the culture of the lab, human-robot interaction, and the formal languages of robotics. The culture of the lab was surprising in its openness to and interest in the conceptual problems of robotics. Seeing ideas such as the agency of robot actors addressed from the perspective of fine art and a robotics lab is truly a rare opportunity. While I was largely teaching myself, the technical skills that I gained would have been next to impossible to glean so quickly working in a different environment. Stylistically there can be significant differences between artists and roboticists, and first hand experience is a fantastic catalyst. Lastly, my initial focus for the fellowship was what I called robot-society tension (more frequently referred to as human-robot interaction). Roboticists approach this problem with respect to the process of designing robotic systems, whereas artists may take a somewhat more all-over standpoint. Dialogues like that have given my experience this summer tremendous personal satisfaction. Updates from my last post. I finally finished the fabrication of the new compressed earth block machine mould, which can produce interlocking blocks. loaded the soil and started testing. Becuase the block was still fragile at this stage, I made a pair of wooden aid for taking the fresh blocks out of the machine without damaging them. Getting ready for constructing a demonstration wall. As I mentioned in my previous post, the goal of the interlocking block is to construct a clean and neat wall, which does not expose any mortar gaps or need any extra plaster or paint on the outside. Furthermore, it saves the mason’s time for leveling and aligning the bricks during the constructing process. The blocks are very easy to handle, and all the mortar is concealed inside the blocks. As you can tell, the wall that is constructed by the new interlocking blocks looks much neater and tidier compared to the wall that is made by local fire-brick or the normal compressed earth block. After finishing the interlocking block experiment, I just realized how little time I had left. Therefore, I started to set up an exhibition space for storing and demonstrating all the samples and materials I used for my experiments. All the samples are carefully labeled with detailed information so that if any student or teacher wants to repeat some of my experiments or make improvements, this space would be very helpful and convenient for them to start from where I left. In the meantime, I also made a booklet that documents all my analyses, detailed drawings, experiments, instructions, and design process. I’m sure that with this document and the samples in the exhibition space, anyone can understand what I have done and what is the goal and value of this research. I do understand that two months is too short for a research like this. I could not say that I finish this project. Instead, I would say that I completed the phase #1 of this project by setting up a resourceful foundation on such topic in Batticaloa. This foundation would definitely help me or anyone who has a similar interest in the future to develop this project. One more class (and blog post) to go! It’s been an exhausting and incredibly rewarding summer, but what I’ve accomplished in this short time only grazes the surface of what is possible… More on that in the last blog post— here’s what we’ve been up to in the meantime! There is a whole room dedicated to water in the Providence Children’s Museum! Class Eight was our first field trip! When I originally designed the curriculum back in June, there were a lot more field trips in the mix. Providence is known as “the Creative Capital”, and we certainly have many amazing local arts organizations. I think that introducing the women to these kinds of organizations will help them understand that we as a society do value the arts and consider them worthwhile. It also offers them the opportunity to visit some organizations that they might not encounter with DIIRI’s usual services, and be exposed to members of the Providence community that, again, they might not otherwise encounter with DIIRI. On top of all of that, it’s even better for the locals to see groups of women wearing hijabs and chattering in Arabic also enjoying what the community has to offer. Providence is already a fairly diverse place, and thanks to DIIRI it is still becoming more and more commonplace to encounter people from widely different cultures. Since the start date of my classes kept getting pushed back, I unfortunately had less openings in the curriculum to go on field trips than I hoped. I really only had two days in my remaining classes that we could dedicate to leaving DIIRI, so I chose the Providence Children’s Museum and CityArts as the two places to visit. Since so many of the women in my class have children and because children’s museums are so wonderfully focused on making and playing, I thought that the women would really enjoy these unique places. I’d first encountered the Children’s Museum two years ago when I visited them leading a cohort of sixty RISD freshmen as part of the Pre-Orientation Service Experience program. It’s a really fun place to be, regardless of how old you are — it even has a huge green dragon perched on top of the building! There are rooms filled with both innocuous objects and crazy structures, and they are all used equally to simply play. The mission of the Children’s Museum is “to inspire and celebrate learning through active play and exploration”. When I was arranging the trip, Jessica (Exhibit Director at the Museum) told me that they are all about “open-ended, self-directed, self-motivated play”. When I asked them to do an activity with the women, in the spirit of show-not-tell (which is turning out to be the mantra of my summer), she told me that they could not do that (see previous quote), but that we would go through the museum together so that they would understand their environment as one that they can touch and play in. Everything in the Museum is very hands-on, and I wanted them to go crazy and just play! It didn’t quite happen like that…but they did still have a good time. They were all fairly reserved as a group, but they did play with some of the exhibits as long as it wasn’t too physically involved. That’s understandable; they were adults in a children’s museum and in an environment they likely haven’t experienced before. But playing with the exhibits together, including one that involved wiring electricity, engaged them and they took a lot of photos. Even that was cool — they probably broadcasted how crazy America is to their social media network, judging by the laughter that into posing for those photos. All in all, we had fun! One of the exhibits involved magnet drawing! …went on without me! Class Nine was the second class that I had to miss to attend the Institute for Design and Public Policy (IDPP). I introduce it more in my previous blog post, but this was an amazing opportunity that I could not pass up. Unlike the last time, in which I simply canceled class, this time I made sure that it happened regardless. The guest teacher was my close friend Tommy (who is also in Apparel), and the regular teacher (me) was Sagitta (a case worker at DIIRI)! Because the women had already been introduced to apparel techniques with Maha and Coleen, Tommy contributed another one of his skills: embroidery. Class Nine was spent learning how to make a variety of embroidery stitches (for use on their pillows) and talking about the resettlement process. I have not yet talked to Sagitta about how the class went (so more on that soon), but Tommy told me that we had an unusually small attendance that day. So, I’m not quite sure how effective the class in my absence was, but that might have just been extraneous circumstances interfering! On my end, I was having a great time reimagining civics in Rhode Island at the IDPP. I was working side-by-side with Rhode Islander’s hailing from places that ranged from the RI Department of Health to the Center for Women and Enterprise. We were all learning about the process of design-thinking and how to apply it to better a community — in this case, it was about how to motivate RI citizens to come together for the greater good. Basically, we were trying to repair the relationship between the people and their government. We did this by pinpointing exactly what strengths we had as a state, what was lacking, and what about our civics could use re-designing. We broke into teams of ten, and it culminated with us presenting to the guest critics our grand vision for the future of Rhode Island via choreography, role-playing, and persuasive speeches. Because I am already a designer, I am already familiar with how to design-think, but the lessons that I received from guest speakers offer new insight into my process. In starting to design my senior thesis collection, I am going to test some of the visual thinking that I was exposed to in the IDPP. As the week went on, it also became increasingly clear to me that artists and designers really do think and problem-solve differently, and that only reaffirms my hopes for my future. But never before have I worked with so many people older than me and in wildly different fields — and it was incredible (I have never asked so many questions about insurance or trustee boards before in my life). I am definitely glad that I had this opportunity, and I definitely recommend it to anyone interested in learning the power of design. The teacher-artist at CityArts was working on this when we walked in. This time, the field trip was more successful. We visited CityArts, another organization in South Providence that provides “free professional art-based education and training to Providence youth in a fully developed community-based arts center that reflects, encourages, and promotes the rich ethnic diversity of Providence, our capital city”. Along with CityArts Program Coordinator Susana, I arranged for the women to work with two local artists decorating a wall in South Providence using ceramic relief tiles. We were invited to join the artists in making tiles to contribute to the mural, which will officially be on display in November. 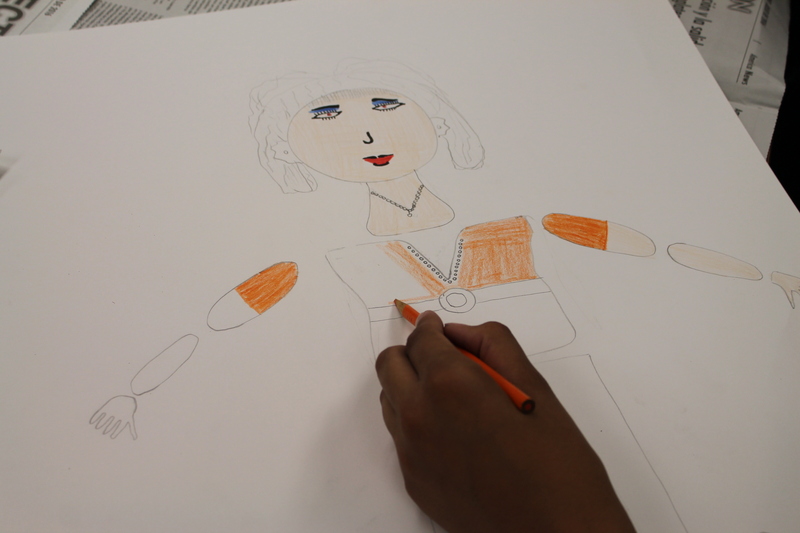 The art that we made at CityArts will be on view in Providence for a long time, and I think that is a wonderful way for the women to feel like a part of the community. The people at CityArts were also very eager to receive us, and I hope that DIIRI and CityArts will pursue this relationship in the future. The women really enjoyed the process of kneading the clay and tracing designs into it. Some of the women made tiles of their hands, and some experimented with carving different shapes using the assorted tools on hand. The entire time we were there, the women and the artists talked about their respective cultures and what it is like resettling in a place like Providence. There was even a long discussion on hijabs! Everyone seemed to be really enjoying themselves, and I loved that this trip had a unique twist of “giving back”. They even learned a new artistic skill that I could not have taught them! We made these tiles, which will then go on to be glazed, fired, and placed in a mural in South PVD! This Thursday is our last class. My final blog post will be about that class (which will involve henna and paper marbling) and to sum up everything that I’ve learned from the Maharam. Until then! The last couple of weeks brought a huge wave of brainstorming, sketching, creating, and discussion with Jason and the team. As of last Friday, I have spoken to 48 different patients, still keeping up a wide age range. The more I spoke with patients, the bigger the game world within the Neuromotion platform grew in my head. What world should they encounter? What sort of problems? The original plan was to have the player go to different cities around the world during the game, but I kept thinking that the metagame could be a great opportunity to imbue something more engaging and creative, while still keeping the experience cohesive. Executive functions are “a collection of top-down control processes used when going on automatic or relying on instinct or intuition would be ill-advised, insufficient, or impossible. For her, there were three core executive functions and an additional minor one. Jason’s current idea is that the mini-games could be categorized accordingly into each function: Cognitive Flexibility, Inhibitory Control, Working Memory, and Fluid Intelligence. That way, the games could be more organized and this would provide a bit more cohesion. Of course, play-testing would be the ultimate judge of this idea, but it’s a start! Sketch— Inhibitory Control: giving into external lures, handling impulses. Lack of: Characters with chronic hoarding issues? Though this metagame idea is farther down the road for the team, it’s important to think of the proceeding steps since the start-up constantly changes. Jason had me start thinking of how these worlds could look, and that we can talk through their accuracy and accessibility. I have to say, it made those hyper-conceptual RISD assignments have come to good use. Project tasks like “Please Illustrate De Ja Vu” and “Create a 12-dimensional self-portrait with gouache” actually DO resurface in the non-RISD world. This gives me hope, albeit a lasting migraine to wrap my head around these concepts while also keeping themes and illustrations understandable. Sketch—Working Memory: Holding information in mind and mentally working with it. Lack of: Some form of negligence. Purposely getting lost and not caring? Aside from this brainstorming around the metagame, we came to the conclusion that there should be an avatar character that the child can play as. I would say pretty much all of the kids feel relatability and customization would be crucial to this game to connect them to the game (as well as having a large world of possibility to explore). If the avatar could have natural dialogue with the friend (coach) as well as with other characters, the experience can play out as a story and less as a one-way teaching tool. I think we can learn a lot when situations play out in front of us; for some reason, we can reflect better in the third person. So in a sense, now friend character will become secondary to this avatar character. We’re now questioning how much the friend should intervene, and how much we can use this narrative framework to instill independence for our users. Jason and I had a brief discussion, and he thought that at this point, the avatar becomes the main character of this game. Thus, when I started to create final splash screens and home screen backgrounds, I questioned whether to represent an avatar as an independent traveler or have them accompanied by their friend. Progress—Splash Screen and Home Screens. Show mid-travel spots. Keeping it vague, but inviting. Progress: Avatar customization. Dr. Alex Rotenberg suggested that this could be an opportunity to use a VAS scale (visual analog scale) where a child can choose an expression that feels represents them. He asked whether that could give insight into “an inherent problem” that the child perceives themselves in a certain way. Also the team has been helping to create other opportunities to introduce the avatar and friend into the beta game. We have a tutorial or “emotional warm-up” where players have to raise and then lower their heart-rate on the screen as well as a game-over screen where the friend, when appropriate or occasionally, could appear with advice. So it’s production mode until the end. With one more week left, I still plan to see more patients. I think this last week would be a valuable opportunity to ask some final big thinking questions. For some of the patients I met, I asked, “What would be something that we should definitely do in this game?” Then followed by, “What is definitely something we shouldn’t do?” One older boy thought that there should be a main lesson in the end, so there’s a working goal. A couple of 7 year-old girls both said that it would be important to have your character travel around and help other characters because that would help them feel better about themselves. If I can share one response that resonated with me these past couple of weeks, it would be one experience in the Inpatient Unit with a teenage boy. He was the only person I interviewed that afternoon, mostly because I had to leave early to see another patient in the Outpatient Clinic. He was a very soft-spoken person, but his face was very physically scarred and his eyes very tired. He was also shaking the entire time. Each time he had to stop to cough, he apologized. A couple of times, he was shaking so violently that he couldn’t verbalize his thought. “It’s okay, it’s okay.” At that moment, his quivering head slowly turned towards me, and I knew I had to look him square in the eye. It’s not your fault, I thought to myself. It’s not your fault. In a weird way, I thought he could hear me. I let him speak for about 40 minutes until I had to leave. Each time he coughed, I waited. Each time he needed to collect his thoughts, I waited more. In the beginning, I contemplated whether or not I should have turned to one of the nurses there to see if they needed to help him. But after those first couple of minutes of speaking with him, I realized that this boy was trying so so hard to get his thoughts across. He was very thoughtful, gave great critical feedback, and really valued the importance of having a character give you advice during the game, not a disembodied voice. Very politely, he shook my hand at the end of the interview. “G-good luck.” I think he smiled a bit. I smiled back. “Thank you so much. G-have a good day.” I nodded my head, thanked the nurse, and walked out with another nurse. Should I have said ‘good luck’ back? Should I have even said ‘have a good day’ even? These phrases are so casual in day-to-day life, but in an inpatient unit, it’s just irony. I thought about this on my way to the Outpatient floor where I realized my patient cancelled and I had another hour or so until my next expected patient. Not to get too philosophical here, but it’s moments like these where it’s important to separate the body from the mind. Though this boy had little control of his actions, his sharp, serious expression exclaimed his presence. It takes a little longer and a bit more patience to really see it, but it’s there. I had to give him time to speak and not impose anything which has been a constant anxiety for me when talking to patients. In a way, this experience has become less about finding information about what motivates these children, but more-so learning to present myself as an active listener and empathetic speaker. How can you really hold a conversation with a child, any child, and have them know that an adult is taking them seriously? Though I may be dressed in business casual and have a fancy hospital ID around my neck, I still want to get down to their level, which really becomes the task for any pediatric clinician at BCH. And there’s a lot more nuances than people think. Some kids have been easier to reach than others, but again, it’s part of the learning. I didn’t study any of these techniques or terminology; at that moment I can only reach them through small questions, a bit of joking, and a handful of writing and doodling. But sometimes simplicity is the answer I suppose? This is an example puppet that I made depicting my high school uniform (yes, I wore a kilt for four years). 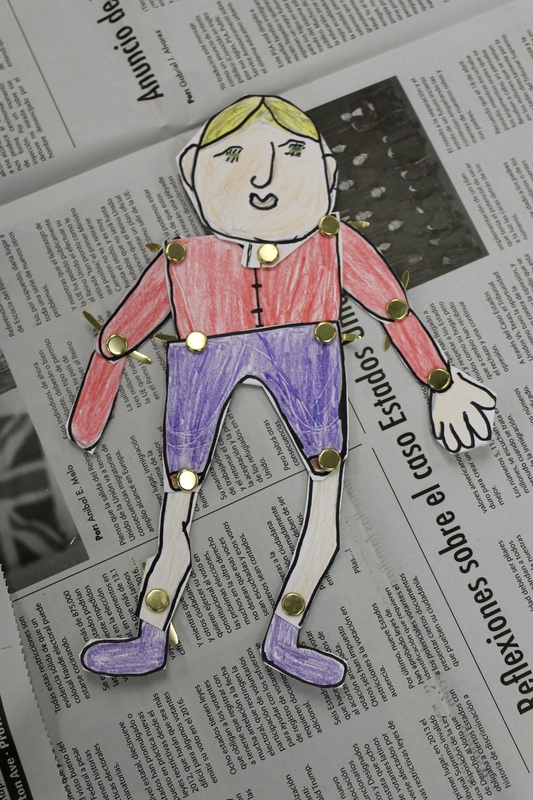 The theme of this project was “Home”, so I encouraged the women to make a puppet about their native culture. Note Natasha’s swimcap-wearing puppet next to mine! Class Four was hosted by my friend Natasha, a rising senior at RISD studying Film, Animation, and Video. Natasha does amazing illustrations and is a really fun person to be around, so I thought that she would be a perfect addition to my class. She was also excited, and we agreed to make puppets using paper, Sharpies, and brads. Natasha originally intended to also teach the women how to animate their puppets, but I had to draw the line there. As I discussed in my last post, showing not telling is the most effective way to communicate across cultural and language barriers, and teaching advanced computer programs does not even come close to the language capacity of our new neighbors. Nonetheless, the women very much enjoyed the project and laughed the whole class. I made my high school puppet as a way to again demonstrate showing, not telling, and I explained how it represented something from home (I doubt that my school uniform from Pittsburgh, PA looked like theirs’). I suggested that they make a puppet wearing traditional dress from home, or a puppet of someone they knew from home, or even a pet from home. Anything to get them thinking about how to visually translate their past and to look forward to sharing it. The whole idea of showing, not telling went over better this class – I was right to try to shift away from focusing on talking. This time, the women did differentiate their projects from each other (except for Sadia, who drew me! ), but they were still staying within the “zone” of my example – a human puppet wearing particular clothing. I am not upset about this, because the results all varied widely (see below) and it might be something that is simply part of the learning process. Above all, they love working with their hands and learning new skills, but we are sharing less stories than I thought we would be. I have yet to decide whether or not that is something I should address – is it enough emotional catharsis to only create art and not talk about it openly? That goes against what I’ve learned at RISD about process and critique, but I think that this might be yet another usurping of a preconceived notion. This is Soukaina’s puppet! After finishing it, she then proceeded to amaze all of us by designing an intricate henna pattern on paper. Rest assured, we will now also be using henna in class. Class Five continued my new model of focusing the class on making. We didn’t even share “One Great Thing That Happened To Me Today” in the beginning of class, because everyone came in and just got down to work! This was a more comfortable environment for me – a group of women all sitting around a table cutting paper and coloring with pencils and chatting amongst each other (in Arabic, Spanish, and English). There was no pressure to do anything; we were all just spending time with each other making art. It was lovely. This is Maha’s puppet of her brother – it elicited a lot of jokes about him and his apparent lack of a neck. He also happens to attend classes at DIIRI, which made it even funnier for the people who knew him. We also gained a new addition to our class, a twelve-year-old girl named Aryana who is the daughter of DIIRI’s Director of Refugee Resettlement and Case Management. This is a truly intergenerational class now, and at least I’m not the youngest anymore! Class Five ended up running late, because everyone was so focused on finishing their puppets. As a result, we didn’t get a chance to share our work. 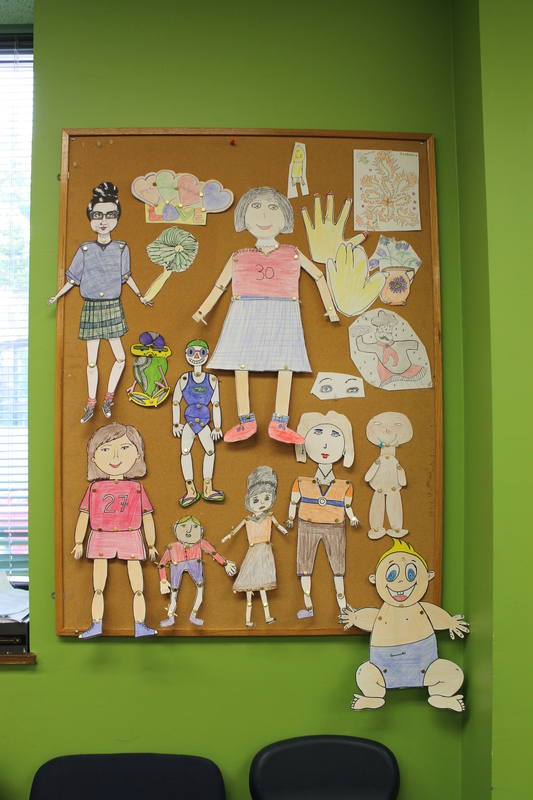 So, while the last people were rushing their puppets, I asked the women to stand up next to the bulletin board and talk about it while people were working. This worked to an extent, but our sharing soon became derailed when other conversations were sparked in response to some people’s work. But, regardless, I am very pleased with the results, and I think that everyone enjoyed puppet-making! Class Six was taught by both a friend and an old professor of mine: Coleen, one of my closest friends in Apparel at RISD, and Maha, the first professor I ever encountered in the Apparel department. I thought that Maha would be a wonderful teacher to my class because she also is from Syria and speaks Arabic. Not only that, but she creates awe-inspiring collections and teaches for a living. Coleen is working as an intern for Maha this summer, so she also joined us as an assistant. They ended up being a big hit, especially with the Arabic-speaking women. After discussing it with Maha and Coleen, we decided to make pillows. Apparel construction is a very useful skill to have, but in the allotted time of 1.5 hours it is impossible to teach that (the idea of teaching patternmaking across language barriers is a nightmare to me). 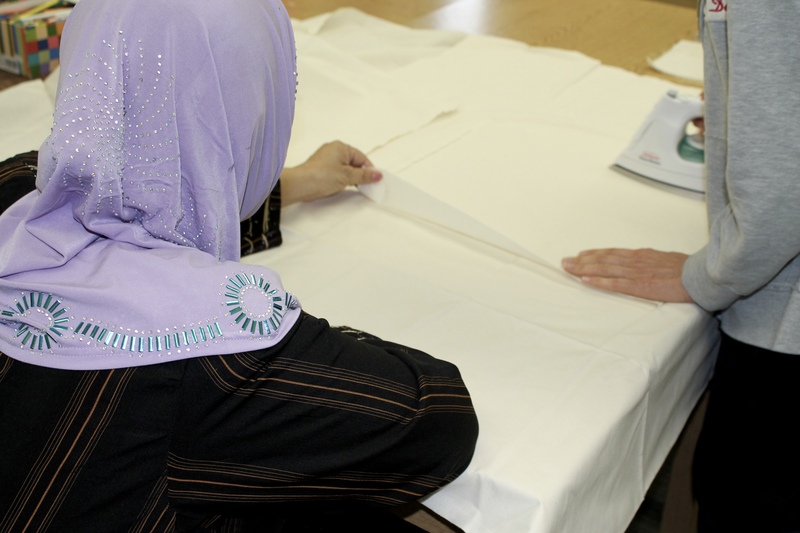 Maha demonstrated how to rip the muslin along the grain, how to effectively iron it, how to hand-stitch in a straight line, and how to turn it inside out and stuff it (all things she also taught me two years ago). Pillow-making was hard for a lot of people, and I don’t blame them! My first year in Apparel was very difficult as well. Maha is meticulous when it comes to construction, so she held my students (and me) to a much higher standard of quality than I do. While I think that is good in the long run and motivational to an extent, I will not be pushing quality as a priority because I feel like that would deter any newcomers to art. For me, art is more about the process rather than the product; anyone can learn how to be technically savvy, but the content is something else entirely. This project is all about introducing the arts into the lives of people who have undergone a great deal. Sadia (on the left) shared with us (using Maha as an interpreter) her previous experience using the fabric muslin for making cheese and diapers. Class Seven was canceled because I have arrived at an interesting time in my summer. The Maharam is my central focus these three months, but I have also recently started a workshop run out of RISD’s Executive Education Department called The Institute for Design and Public Policy. For five days, I will be learning about the design-thinking process and how I can apply it to the public and private sector to redefine the idea of civic duty. So far, it is essentially me with a group of nineteen company executives who are all at least twenty years older than me listening to speakers trying to explain how artists think. Don’t get me wrong, I’m only two days in, and I’m overwhelmed with new information, but it was very interesting listening to artists try to make the design-thinking process accessible to non-creative thinkers. It is such an abstract concept (and kind of funny trying to articulate how my brain works), but it really makes clear to me the valuable role that artists have outside of the art world. The way we approach problem-solving and our experimental process that values failure as a means of growth is apparently unusual but revolutionary (especially within the government). I am very interested in this idea, and I plan on pursuing it after graduation. This Institute is also highly relevant to my work with DIIRI, so after I complete it I will share with you everything that is applicable! I tried to find a way to keep the class going (playing with a homework assignment, open studio, guest teachers, field trips, etc), but in the end it was easier to communicate that the class was simply canceled. There is a second class that I have to miss for this Institute, but that day will be facilitated by Sagitta – the show must go on! And, to top it all off, I am finally getting the details finalized to introduce community partnerships – for Class Eight we will be visiting the Providence Children’s Museum to expose the women to arts organizations in the community and potential outlets for their children. A few classes later we will also be visiting CityArts! There is a lot going on, but then again, that is not unusual for the Maharam. Dear everyone, I’m starting to blog. Hope you’ll all have me back. Old farm dog Veil takes a breather in the shade, and I in the calm of a blank page. As a newcomer to the divisive world of California groundwater management, starting to blog feels ill-advised. Like, gag-reflex ill-advised. Copy-pasting a secondhand condolence letter ill-advised. Wearing a heat-sensitive hypercolor shirt to a job interview ill-advised. High risk, subterraneously low reward. I’m not stalling. I’m savoring the end of my grace period. This isn’t about shyness. If anything, boldness is to blame. I’ve got no qualms walking up to powerful person X, introducing myself, nodding with genuine empathy as they enumerate their frustrations with powerful person Y, and then, with equal aplomb, calling up Y to set a time to meet. So far I’ve been able to find my words for the person sitting across from me. Blogging requires me to find words for more than one “you” at a time– words for both X and Y. But if it’s going to be worth a read it, I’ve got to dive into the very crux of X and Y’s differences while somehow honoring the legitimacy of both of their experiences. This doesn’t leave much low-hanging fruit. What if it’s all out of my reach? To make matters worse, I’ve got something to lose: the benefit of the doubt. Before I post this, I’m a blank slate. In a political climate where every affiliation brings with it a set of expectations, history and even past hurt, I’ve got no record. I let people know I’m a fellow at the California Institute for Water Resources putting together a story about the emotional landscape of groundwater regulation (more on this coming). For the most part, I’m perceived as harmless, impressionable and potentially useful. This relative anonymity has granted me access to a wonderfully wide swath of stakeholders. I’ve interviewed a dozen growers, ranchers, lobbyists, scientists, regulators, and activists. Sure, I’ve heard a few quips about absent political opponents. But on the whole, I’m blown away by the nuanced and nitty gritty work of bipartisanship I’ve seen underway. So what am I so worried about? I’m on eggshells because I care about these conversations and the trust vested in me by the people I’ve spoken with. A lot. I want to get it right. But I’m a rookie and this is California water politics, so getting ‘it’ ‘right’ isn’t really on the table. I can’t make everyone happy, and, once I enter the conversation, I can’t go back to square one. But the free pass I’m giving up was never really mine in the first place. These doors opened out of the generosity, grace, and optimism of others. As much as I’d like to take credit, I had little to do with it. Luckily, the people I fear will find me two-faced are astute adults who know better than to think theirs is the only side I’ve heard. Many of their own careers hinge on their ability to cross ideological lines. Each has placed a stake in the debate, be it through their employment, affiliation, or writing. Each has still found ways to have meaningful conversations with people who disagree with them. Unlike my newbie free pass, they’ve earned this access over years of building their professional reputation. Sooner or later, I’m going to have to earn my access as well. To all I’ve interviewed so far: Thank you for your trust. I hope that what I do with your stories earns the kind of welcome you’ve given me on credit. Eurecka!!! Louis Pasteur forgot to close the window to his laboratory and discovered penicillin. The pacemaker was invented when Wilson Greatbatch was working on a heart monitoring device and pulled out the wrong resistor. And the new, hybrid, paddle-board hull was created during a serendipitous moment in a buoyancy testing session. Our high school class gathered to discuss the scale models for their paddle board designs. Most students created 1/10th scale prototypes while one group went with a 1/5th size. As we talked about how the features of each form would affect the performance of the board, we decided to conduct a test in water. The tide was out, which allowed us to find just the right tidal pool in which to conduct our tests. Everyone set their boards in the water and weighted them with water bottles. We knelt around our test-pool, pushing foam boards around and discussing how each reacts uniquely, but none contained just the right combination of qualities we were looking for. The flat boards were less likely to tip but were more difficult to propel. The v-shaped hull cut through the water but was easily tipped. Shaping the stringer (central wooden board) to initiate the building phase! When the focus shifted from observation to the discussion, the kinesthetic students started playing with the boards like little kids playing with toy boats during bath time. One of the small v-shaped boards got lodged underneath the large flat-bottom board. Someone picked it up and said, “What if we align the small board down the center and see what it does?” Held by water tension, the boards stuck together. They placed the new design back in the water, gave it a shove, and EUREKA! We found the attributes we had been looking for, all along! Suddenly, a new energy and excitement came over the group and we spent the next two hours spooling up for the full-scale prototype.While the high school class continues to rock the design process, the marine class has been less successful. Work and duty schedules, island-wide travel restrictions for military personnel, and constrictive communication channels on base continue to inhibit young marines’ participation. Each week a new combination of students shows up, which makes continuity difficult to maintain. As I have pondered this development, I’ve wondered how to work around it. Rather than an eight-week program, one or two multiple-day intensive sessions might work better. If the program were to go all day over the weekend, and then during the next two evenings during the week day, scheduling may be more manageable. It is difficult to say for sure without trying it. A leader who is here long-term also has the advantage to scheduling sessions throughout the year. Although attendance is unpredictable, good conversations continue each week, and we all continue to learn from one another. During some of my down time, I have been able to enjoy the island and local culture. Last week, I received news that a friend would be on island. I met him during a random pit-stop in Iowa, while on a road trip in 2003. Two or three years later, we randomly ran into one another, again, in Mainz, Germany. This time around, I heard through mutual friends that he was coming to Okinawa for a meeting. We caught up over Japanese curry for lunch, where I discovered that he collects pottery. I took him up to meet my good friend, Mitsunari Miyagi, who generously gave us a tour of his studio and 40 year old family kiln. Miyagi-san is a master potter and long-time friend. This awamori (Okinawan sake) flask displays his crab design, for which he’s well known. Miyagi-san is a traditional master potter. His grandfather was designated as a national living treasure for helping to save the traditional craft after WW II. When I previously lived in Okinawa, Miyagi-san was my neighbor. Even though we spoke very little of one another’s language, we grew to be good friends through art, baseball, and cooking (he’s a fan of bratwurst). One of my dreams is to open a gallery to show and sell the incredible pottery that Miyagi-san and other Okinawan artisans produce. Having now spent some significant time in the lab and with the roboticists* here, I’ve found the relationship between robotics lab and artist’s studio utterly fascinating. On a personal level I’m much better acquainted with the latter, which makes the experience all the more edifying. There’s an immediate danger of generalization: it does a horrible violence to group all roboticists together, just as it would to group all artists together. Mathematician G. H. Hardy, on the topic of Ramanujan, wrote that “all mathematicians think, at bottom, in the same kind of way.” This tends not to be a very useful approach for learning about a new environment, particularly one as multifaceted as a robotics lab. Roboticists themselves often come from a myriad of STEM backgrounds such as mechanical and electrical engineering, computer science, and physics (I’ve met some people from each of those specialties here). But more than that, their ways of addressing problems, and their sense of what constitutes an interesting problem, varies between individuals in the same way it does for artists. On one level, some roboticists take a more conceptual/theory-based approach that attempts to address the nature of human/robot interactions, while others tend to focus on specific technical problems. This is never an absolute dichotomy, though, as it shouldn’t be! Those approaches are always on some level working concurrently. In many ways this mirrors the way that artists work (particularly concerning technology and digital media), which I feel make the two commensurable. But there is a difference in emphasis that makes the interaction of the two truly galvanizing. The place of STEM in our culture tends to facilitate certain approaches to technical rigor and innovation. Artists who add to this discourse via STEAM have very different ways of facilitating that conceptual/technical dialogue, often with great fluency and nuance. Like roboticists, artists have a responsibility to develop the conceptual and technical aspects of their practice in tandem; it is how they do so that gives them a place in STEAM. Although spellchecking often disagrees, roboticist has a Wikipedia page, so it’s a real term!